Americans drive fewer miles today than in 2005, but since that time the nation has built 317,000 lane-miles of new roads — or about 40,000 miles per year. Maybe that helps explain why America’s infrastructure is falling apart. The new data on road construction comes from the Federal Highway Administration and reached our attention via Tony Dutzik at the Frontier Group, which studies trends in driving. In 2005, Americans drove just above a combined 3 trillion miles. Almost a decade later, in 2013, the last year for which data was available, they were driving about 45 billion less annually — so total driving behavior had declined slightly. Meanwhile, road construction continued as if demand was never higher. Between 2005 and 2013, states and the federal government poured about $27 billion a year into road expansion. According to FHWA data, road expansion was spread across highways and surface streets fairly uniformly. That’s actually a faster pace than in previous decades, Dutzik points out. For the whole of the 1990s — when gas was cheap and sprawl development was booming — the country added, on average, about 17,000 lane-miles a year, less than half the current rate. This is further evidence that America’s “infrastructure crisis” is due in large part to spending choices that favor new construction over maintenance. Related to this topic, I believe there are two relevant issues that need expounding on: induced demand and congestion/delay. Every so often in news having to do with road-based transportation I see information about induced demand. The way I understand this, this refers to the tendency of a newly constructed or newly expanded roadway to fill up with vehicle traffic subsequent to the construction being completed. In regard to the referenced average approximate 40,000 lane-miles of new roads added yearly, if induced demand does in fact come into play and these new lane-miles fill up with traffic, then this would suggest to me that overall, vehicle miles traveled (VMT) should be increasing, a decreasing per-capita VMT notwithstanding. 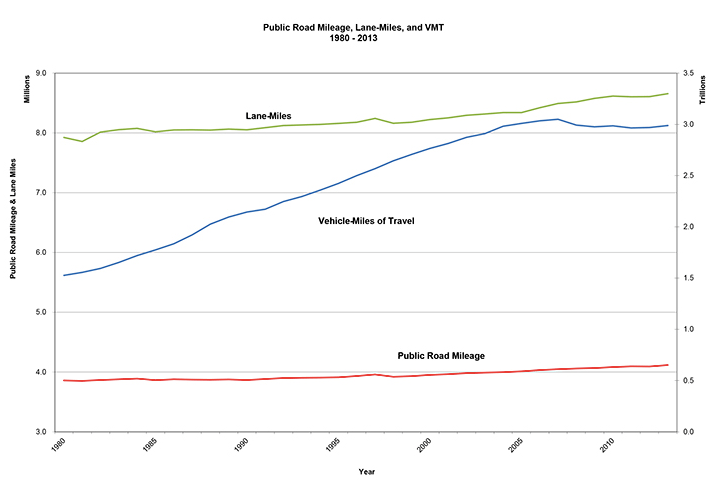 What I have seen is that aggregate VMT has been increasing. Secondly and lastly, and related to congestion/delay, with approximately 40,000 miles of road additions each year, one would think the bulk of the lane-mile additions made would be for the purpose of trying to lessen roadway congestion and hence reduce corresponding delay. What I would want to know is just what effect all this roadway building is having on congestion and corresponding delay: Is there less of it, more of it or is it remaining relatively unchanged? You could also use that chart to argue that from 1980-2005, we under-invested in new roads and are still playing catch-up, even though driving rates are slowing or dropping. Also that graph is confusing since it has two different axes, one that goes from 0 to 3.5 and the other that goes from 3 to 9. Very misleading when trying to compare trends between plots on both axes. I wonder if the lane mile growth is happening in exurban, uncongested areas where induced demand doesn’t apply. The right axis is about 1000X higher, how would you handle it? We need a second vision zero – no new highway expansions. We clearly aren’t willing to pay the taxes needed to maintain what we have. We need to find ways the shrink the highways to the level we’re willing to maintain and find ways to use what remains more efficiently. Two axes is fine, but the left axis should start at 0, not at 3 (million). What typically happens with induced demand on freeway expansion is that the increased congestion isn’t from new drivers it’s from people who are new to the freeway. So the VMT is not moved (in fact it may go down because the freeway, despite the congestion, may be a shorter trip distance). A big reason for the VMT drop seems to be that our largest generation is eschewing cars and even licenses. That, of course, could be due to economic challenges but really if that trend continues and us boomers start “aging out” of driving it will be much harder to argue for more roads. Many highway expansions are tolls. Moreover, there are needs of highways in certain places, especially certain new medium and long distance connections around areas whose population boomed last decades (such as an upgrade of US-93 to I-11 between Las Vegas and Phoenix, which were merely small towns in the 1960s and now are big cities, one of them a top-10 (population) in the country. Congested highways can be seen as being in a state of equilibrium, in which widening the highway has the immediate effect of converging new riders from otherwise alternate road/transit routes and off-peak commutes to the peak highway until it reaches a new state of congestion. The transit expansion alternative, when paired with peak congestion pricing, offers a more flexible way for cities to handle peak volumes away from this static equilibrium. Americans may be driving less on a per-person basis but some parts of our country are still rapidly-growing at 2-5%/year too, and in those places, building new highway capacity as well as new mass transit capacity is mandatory. Imagine if Cleveland was growing at 5% per year like El Paso is? You would be screaming for new highways to be built after spending a couple hours trying to commute downtown each way from Solon, Mentor, or Bay Village every day. Either that or you would be moving your business or your employment situation out of downtown to try to save your increasingly precious time too. With Less Driving, Can We Tone Down the Hysteria About Congestion?